Published on Jan 17, 2017 at 02:00p.m. We want to take this opportunity to notify the citizens of Verona of a very destructive pest that will be affecting some of our local shade trees in the near future. The Emerald Ash Borer (Agrilus planipennis) is a very devastating insect pest to all Ash trees and the White Fringe Tree. At this point in time there aren't any natural controls here in North America. The insect recently has reached Montclair, our neighbors to the east. So I would expect that the insect will be here in Verona this year. Most of the Ash trees in town are on private property and wooded lots. It is recommended that homeowners contact local tree experts to assess their trees and to develop a plan of action. In Verona we have very few Ash trees as street trees. The Emerald Ash Borer is a small greenish insect, 0.3 to 0.5 in length, which lays its eggs on the stem and branches of the Ash tree. The eggs then hatch and the larva burrow their way in to the cambium layer of the tree. This is where it feeds and develops. The channels that it makes while feeding disrupts the flow of water and nutrients though out the tree, killing the tree in two to four years. If no action is taken then it is almost certain death to the Ash tree. The ash tree dies by drying out, its wood is brittle because the borers cut off the vessels that carry moisture out to the branches. A dead or dying ash must not be left standing in your yard. A falling tree or branches could harm people or damage buildings and cars. There are chemical controls that work well but it is a long term program, twenty years or more in length. 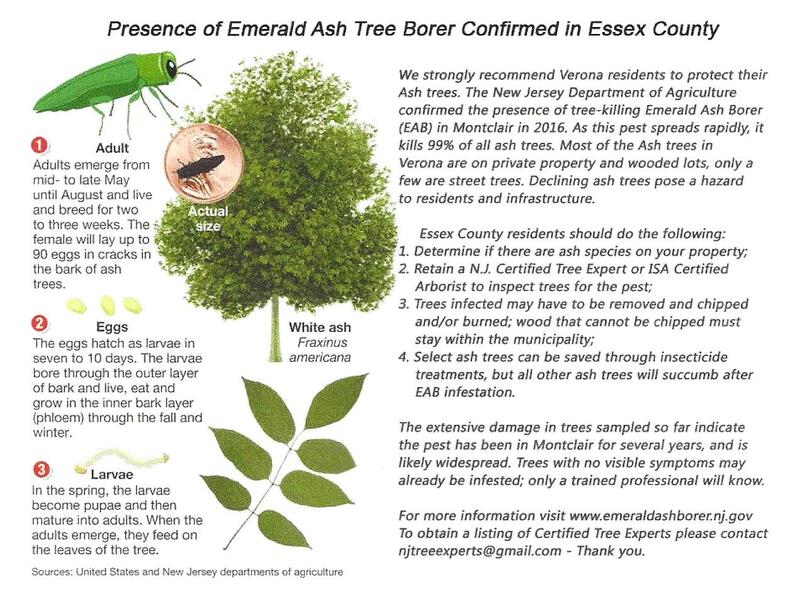 The New Jersey State Forest Service recommends that any pesticide treatments to save ash trees from EAB should be done sooner rather than later, as treatments are most effective prior to EAB infestation. Homeowners need to assess the value of the Ash trees on their property while developing a plan of action against the Emerald Ash Borer.